Next a little morph of a plain store bought wreath from Michael’s for 2.49, …a faux one..it’s on top of the bag..
Add fresh cut greens from the yard, pinecones etc. wire on a French Horn I have had for years, ( I cleaned it with Brasso first) I made a nice big bow..and there you go! I will add some more ornies and fresh baby’s breath next week. Have to get the whole door ready for Karen’s DOOR party on the 15th! It makes little individual cakelets. I am try to think how I can use this Fall item with Christmas..Maybe brush them with some edible gold?? Any idea to make them Christmasy? I will have to play with them..maybe make them look like little elf faces?? I also got the Message in a Cookie cutters. They too were less than 8.00. I didn’t have much time to play with them, but took Monique’s suggestion to use Ina’s shortbread cookie recipe and press really hard ! I had let Monique know about them as I knew she would like them. I am sure hers will be gorgeous!Go see her beautiful dove cookies and more! I did dip some of the feet in melted chocolate. I hope to experiment more for this weekend.. Here he is getting Elmo painted on his arm…That clown, Lovey Dovey , is like a part of the family! LOL..She has been to all 4 of their birthdays and Christenings in between starting 8 yrs ago..…I think this is the last we will see of her! She does a good job..there were 17 little ones there for the party..
For Susan’s Deck the Halls I share with you my son and dil’s mantle and china closet decked out for the season.. I am linking up to Susan’s Metamorphosis Monday at Between Naps on the Porch..
Kathy at Kathy’s Cottage Homemade Holiday. Susan’s Deck the Halls… At Thoughts from over the Rainbow..
And the winner of my blogaversary, (that just term just cracks me up!) is Kammy. Please email me your name and address..enjoy! Thanks for all who left comments, and I will do another one soon. I hope to be back for Tablescape Thursday…only 3 more Thursdays till Christmas.. Your wreath is so nice - great job ! Your kiddos mantel is very beautiful - Wow ! I think you have gone over the party limit on this post - Watch out for the Blog Police ! LOL ! Everything looks so pretty - really like the mantle. Looks like a fun time at the party. Thanks for sharing. Oh how cute are the acorns. The cookies too. You are very creative.Your wreath looks so professional. I think you may have missed a couple of memes out there somewhere. Lol. Good for you. Go big or go home as they say. I am glad to see Kammy won your giveaway. She is such a great blogger. She visits and follows so many blogs and comments regularly. I remember when Declan was born, what has happened to the time! He's such a big boy now. Love the cookies and I'm now looking for the Message in a Cookie! That may have been the longest blog post title I've ever seen - LOL! I love those cookie cutters from WS and will try to score a set after Christmas. Hope you and your toufy are good tonight! Oh, that mantel is gorgeous. I can't imagine 17 little ones all at once! Must have been quite a party! Great job on the front door wreath Kathleen...it looks beautiful. Seems like everyone had a ball at the party. I'm sure those cookies were a hit. They did a lovely job on their mantel..it looks very elegant. Hope you are getting some well deserved rest. Hi Kathleen - I'm SOOO sorry to hear about your root canal. Hope you are feeling OK now. You are one busy lady. Love your little gingerbread boys with Declan on their tummies. I was in WM today looking at the box of cookie cutters. I didn't buy it, darn it. Adorable post!!!! Your cookies are great:) Lovey Dovey too! The wreath..your son and DIL"s home..It's a Wonderful Life! I absolutely loved it. So creative and cute. I love the acorn pan. Now I was thinking depending on what type of cake you baked in the pan. You could add a little dab of white frosting, and then add a little cinamon red hot candy to it. It would give it the red color and be tasty. You could actually even use a little dab of green frosting and then add the red hot. Looking at the picture of the cakes, it looks like a little red hot might just fit on those bumps of some sorts with a little dab of frosting. Kathleen, that's what I'd call a multi-tasking post. ... It looks like Declan had a wonderful birthday ... cute cookies. Lovey Dovey seems to really have the little ones engaged. ... Your son's and DIL fireplace and mantle are beautifully decorated. Lovey Dovey the Clown, LOL! 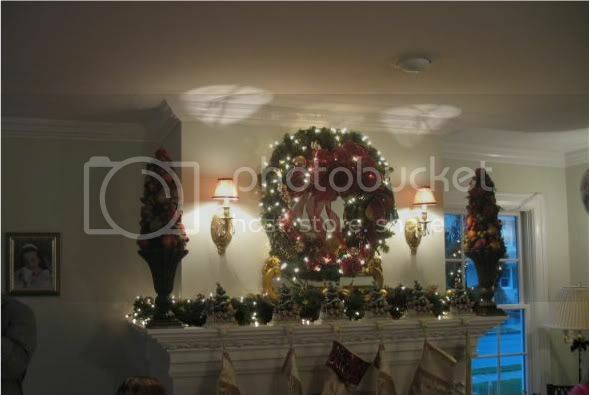 Looks like a great party, Kathleen :) The mantle and the China Cab look so festive, very pretty! Cookies look great! I bet you could have had fun with those cookie makers in your classroom! I wouldn't have been able to resist that acorn pan at all! I've gotten a lot of decorating done. I have decided that I probably won't set up the last tree in the study. I have too much other stuff to do. We will get by with the six that are up right now. They aren't all large, so it wasn't horrible getting them all done.Just time consuming. Your son's fireplace mantel is so cool. I like how it is three-sided around the chimney. I love the wreath/French horn on your door...beautiful. Wow, an acorn pan...bet peanut butter fudge would be cute done in that pan, or are the molds larger than they appear in the photo? Your daughter-in-laws mantel is gorgeous. Declan is adorable...so are his little gingerbread cookies! You did a fabulous job on the front door wreath! I love it. And the cookies are delightful!! How would the acorns looks with just a dusting of powdwered sugar on a platter surrounded by some spruce branches?? I love your front door wreath, I have had a french horn in my Christmas decorations for years and just could never get it to work on a wreath, why I never thought to make it the center of the wreath is beyond me, but I didn't. Thank you for such inspiration. Everything looks so nice, very festive and very fun! Great job! PS I forgot to say that I LOVE your wreath! That French horn is perfect! Kathleen-SOOO sorry about your root canal. There is almost nothing worse than mouth pain. What a good idea to add the fresh greenery to the wreath! I love the French horn and the idea of putting baby's breath in it. The acorn pan is TOO cute! Thanks for linking and sharing the birthday party too! Wow everything here is beautiful, but that mantel is amazing. Those gingerbread men are a wonderful idea with a message. What a beautiful post, dear one. Your cookies...the cutest things. Tell me, please. What kind of chocolate do you use for dipping cookies? I want to do some for Christmas Eve. Love all the decorations...that mantel looks amazing. I'm not sure he will have enuf money this year :O(...but, if not, maybe next! WONDERFUL mosaic and SIGNS OF THE HOLIDAY! I better get busy!!!!! Lovely. My husband just had a root canal - hopefully they gave you lots of pain medication!! Your decorations are absolutely beautiful!! I plan on putting my 300+ snowmen out this weekend - I can't do it too early because it drives my hubby nuts if I decorate the day after Thanksgiving!! First - I hope your root canal pain is gone! Second - thanks for stopping by my blog and leaving a comment (I have since painted those candle sticks silver). The wreath is beautiful - I love the horn on it and you make such nice bows! The gingerbread men look yummy! My daughter has the acorn pan and we share it or I should say I borrow it all the time. We made chocolate cake acorns and just sprinkled powder sugar on the top. They looks cute and some looked a little ugly:) We ate the ugly ones because it is a sin to waste chocolate foods:) Everyone loves when we bring the regular corn muffins in a pretty basket with some honey butter. I made spiced nuts today and they look ugly but taste good. Maybe I need to eat those too:) Now those little name stampers are the cutest and yes Mr. Vundervants would like them. I forgot to say OUCH a root canal. I am not sure I have many teeth left that have not had a canal. I am sure I sent my root canal dentist to the grand canals in Venice on what the canals cost me:) I hope you are feeling better soon. Sorry about your root canal. I've had several and they are no fun! Your personalized cookies came out great. It looks like a good time was had by all at Declan's party. Your son and DIL's decorations are gorgeous! Wow, you packed a lot into this post! A mosaic, a great purchase (and yes, of course I want an extra if you've got it), adorable cookies, a party and your and dil's decor! Phew! Hope you're on the mend from the root canal. Aww, what little boy wouldn't be tickled with his own army of short, shortbread men? And you've given me an idea as to what to do with an old french horn I had tucked away. You've probably noticed I have a thing for wreaths. Hi....your wreath is beautiful...Love that French horn. Oh I forgot to say that I hope your feeling okay from the dreaded root canal....is that not the worst thing to have done...almost as bad as childbirth!! Oops! Sorry about that root canal! And I have to say I have never seen a more lovely home. Your decorations are smashing and in such perfect taste! So glad Susan sent me over. I had no idea about the Sonoma cookie cutters; such an adorable idea. Merry Christmas to you and now that I have found you, I hope we will become blogger buddies!